Walk and wade fishing is the most common way to fish in Vermont. Trips are offered either half day or full day and can be tailored toward best times to fish or your schedule. 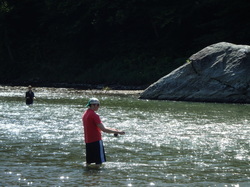 Wading gives the angler access to all varieties of water from our large rivers such as the Lamoille and Winooski, to all of the medium and small size streams that flow throughout the area. Wading trips allow us to select the particular river we fish based on current conditions such as river flow, temperature, time of year, desired species, and angler ability. I enjoy tailoring a wade trip to each client. Some experienced anglers may want to fish a completely wild trout stream looking for larger rainbows and browns, choosing quality over quantity and the challenge of fooling a large wild brown. 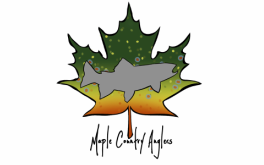 Other anglers may be new to the sport and we might go to an area that holds a lot of trout and where casting does not need to be as technical in nature. These wade trips are also great opportunities to work on a particular skill or dial in a new style of fishing, perhaps brushing up on your nymphing techniques or maybe you want to learn to fish a dry fly/dropper outfit. I am an expert in tight line or European nymphing tactics and would love to share this new and deadly tactic with you. European nymphing has taken the fly fishing world by storm and is, in many scenario's the most effective tactic in catching large numbers of trout. Please feel free to request a trip dedicated to tight line nymphing. ​We can accommodate larger parties. Please contact me regarding a second guide.